Mike and I are going to Santorini, Greece for part of our honeymoon so for my birthday a few weeks ago, Mike got me this dress thinking it would be perfect for the island! I love the cinched waist and the cut of the neck and back, I know it's going to get a lot of wear this summer but I am certainly most excited to wear it in Santorini! I also wanted to mention these sandals, which are by far my new favorite. I would never think to go to Skechers for sandals but my mind has been changed. 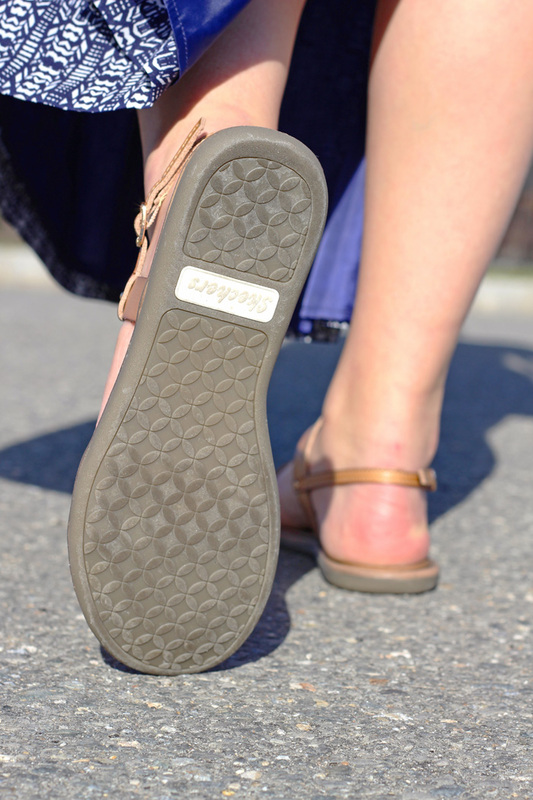 The soles are so cushy and I love the simplicity of them, they are perfect for everyday wear! Get ready because I think you will be seeing a lot of them this spring and summer! Beautiful! Love the color and print of that maxi dress! Found you through the Trend Spin Linkup. Love this look! That dress will be perfect for your trip for sure. Cute sandals as well... don't you love unexpected finds like that?! I was in Bass Pro over the weekend with my brother and ended up buying the cutest blouse! Who would have thought!